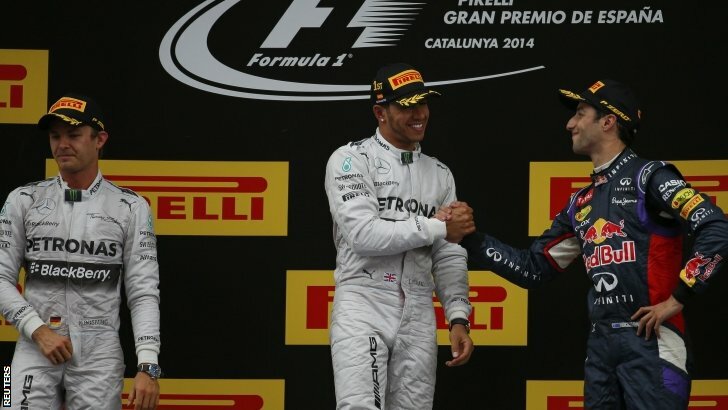 Formula One: Hamilton holds off rampaging Rosberg to win in Spain! 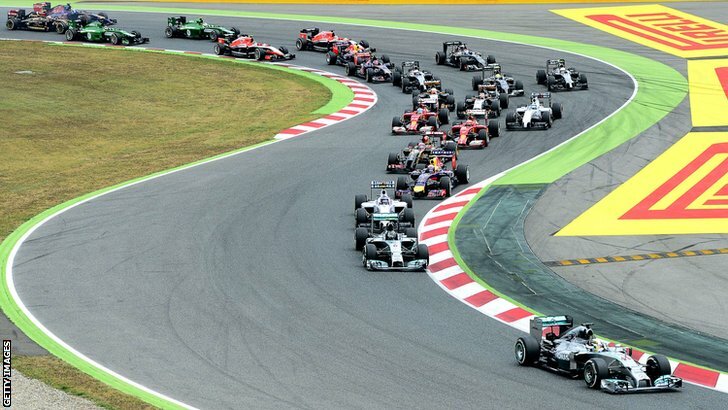 Home » Formula One: Hamilton holds off rampaging Rosberg to win in Spain! Lewis Hamilton has won the 2014 Spanish Grand Prix at the Circuit de Catalunya after holding off a late charge by team-mate Nico Rosberg. Mercedes cars led every lap of the race, but it wasn’t straightforward for Hamilton who struggled with under-steer, over-steer and miscommunication on the team-radio. Daniel Ricciardo finished in 3rd place, the first time that he will stand on the podium and keep the trophy after being disqualified from his 2nd place finish in the season opening round in Australia. Ricciardo was 50 seconds behind the race winner Lewis Hamilton, with Sebastian Vettel having an aggressive drive to finish 4th after starting 15th. 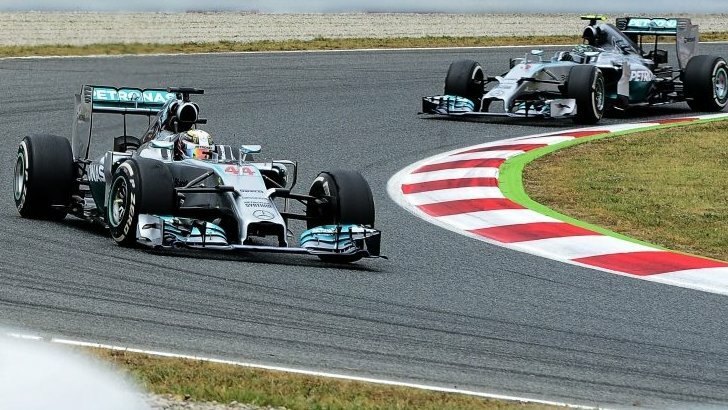 Both Mercedes cars made similar starts away from the grid when the lights went out; Hamilton kept his lead over Rosberg, with Valtteri Bottas slipping past Ricciardo to move into 3rd place. Romain Grosjean locked up massively into the first turn, but managed to avoid contact with any other drivers. Kevin Magnussen had a nervy start from 14th on the grid as he put two wheels on the grass on the run down to turn 1. He managed to keep his cool and ended up attempting a pass around the outside of team-mate Jenson Button at turn 13 only to end up going wide. Magnussen re-joined the track before the chicane but then almost got his front-wing chopped off by Sebastian Vettel. 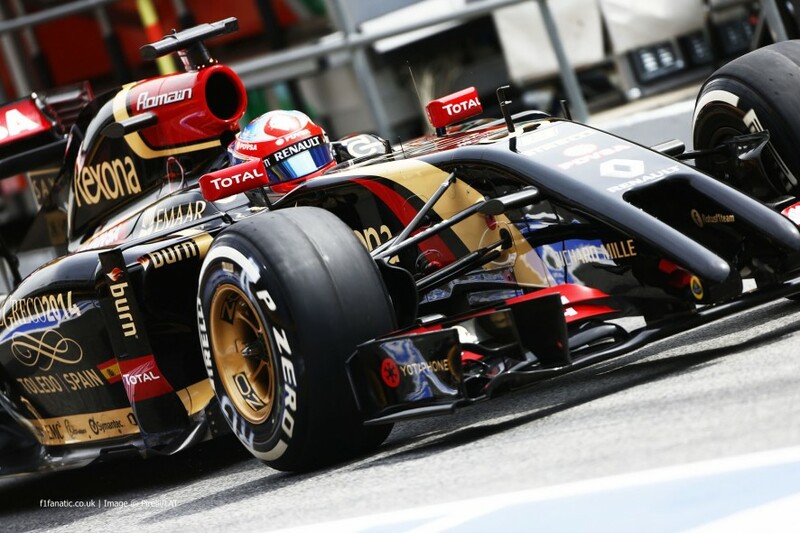 Pastor Maldonado was in the wars once again as the weekend which started so promisingly kept on unravelling. Pastor had started from last on the grid and was trying to fight his way past the Caterham and Marussia cars. He made an aggressive move for 20th place on Marcus Ericsson at turn 11 which saw the pair end up off track. Both cars recovered to carry on racing, but Maldonado had earned himself another stop-and-go penalty. Daniel Ricciardo was busy fighting with Valtteri Bottas in the opening stages, as the Australian attempted to take back 3rd after losing it at the start. The Red Bull looked to not have the power to pass the Martini Williams down the straights, but it closed up through the corners. The Australian had to drop back a little to cool his car down before launching another attack on the Finn; but there was no gap to be found for Ricciardo yet. Daniel’s team-mate Vettel was the first man to pit on lap 13. He re-joined in 21st place, with Ricciardo choosing to pit a few laps later to try and jump Valtteri Bottas during the first pit-stop phase. The strategy worked, with Bottas seemingly waiting too long to pit before emerging behind the Australian. Hamilton pitted from the race lead on lap 19 and had the Medium tyres fitted to his Mercedes. Rosberg followed him in a few laps later, with the team choosing to split strategies by fitting the Hard tyres; a similar strategy to that seen in Bahrain. The pair traded gains and losses during the second stint, with the race building up to another showdown between the team-mates. Romain Grosjean was holding on to his qualifying position of 5th after the first pit-stops, but was soon coming under attack by the Ferrari duo of Raikkonen and Alonso. The prancing horses appeared to have more power than that of the Lotus car, with Raikkonen and Alonso blasting past the Frenchman on subsequent laps down the start/finish straight. The second phase of pit-stops started very soon for those drivers on 3 stop strategies, with the two Mercedes drivers on a two-stop race. Alonso and Vettel were among the first to pit, with both drivers using their fresh rubber to end up in 7th and 8th place. The two leaders stayed out on track and kept on edging closer together and then further apart. Hamilton was complaining of under-steer before the team offered a solution which gave him too much over-steer. All of the fine tuning of settings within the cockpit started to pay dividends as he pulled out some vital tenths over his team-mate. With Hamilton on the faster tyre, he had to pit first of the two Silver Arrows on lap 43. Nico wasn’t able to stay out on track for much longer as he complained that his tyres were graining. He pulled into the pit-lane a few laps later and now had the Medium, faster compound as opposed to Hamilton’s longer lasting Hard compound of tyre for the final 21 lap sprint to the finish. Hamilton was getting frustrated over the radio as he wondered why they bought him in so early when he could have continued on for a few more laps. He then started suffering from graining on his tyres, which allowed Rosberg to start reeling him in. The pair once again interchanged fastest laps between themselves, with Hamilton occasionally pulling away before being caught once more by Nico. With less than 10 laps to go Hamilton’s lead was down to just under 2 seconds, with the gap put down by another half a second a few laps later. Nico looked to have the momentum that he lacked in the Bahrain showdown as he hunted his team-mate down to break the Britons run of wins. Four laps remained in the race and the gap was just 1.2 seconds between the two leading Mercedes cars. Rosberg was on the edge as he tried to get into the vital 1 second barrier, which would allow him to use the two DRS zones to try and pass Lewis. He finally managed to duck underneath the 1 second mark at the start of lap 64 out of 66. The DRS allowed him to close the gap just 0.6 seconds as the pair started the final lap, but Lewis managed to give it everything and stay ahead. The pair were separated by just over half a second as Lewis Hamilton crossed the line to take his first win at the Circuit de Catalunya, with Rosberg having to settle for second for the 4th time in a row! The result meant that Mercedes secured their first run of 4 1-2 finishes since 1955. 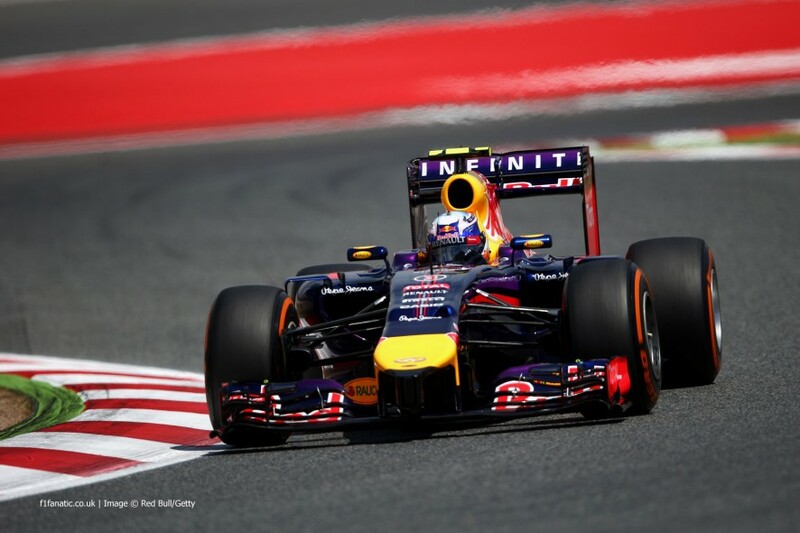 Daniel Ricciardo came home 50 seconds later to secure his first official podium finish of his F1 career. His team-mate Sebastian Vettel had a forceful drive to take 4th place after lunging up the inside of drivers like Raikkonen and Bottas at the La Caixa hairpin. He made up the most amount of positions than any other driver on the grid after starting from 15th place after a dismal qualifying. Valtteri Bottas equalled his best ever Grand Prix finish by coming home in 5th for Williams, with home-town hero Fernando Alonso overtaking team-mate Kimi Raikkonen in the closing stages to take a hard fought 6th. Romain Grosjean took his and Lotuses first points of the season in 8th place, with the two Smirnoff Force India cars of Sergio Perez and Nico Hulkenburg completing the top 10 after a close battle between the two team-mates. The two McLaren’s finished just outside the points, with Button edging team-mate Magnussen for 11th place. Felipe Massa was 13th after fading from the points paying positions in the closing stages of the race. Pastor Maldonado came home just behind Russian rookie Daniil Kvyat after recovering from his stop-and-go penalty earlier in the race. The two Saubers, Marussias and Marcus Ericsson completed the list of finishers. Kamui Kobayashi was forced to retire his Caterham after suffering a brake failure. Jean-Eric Vergne’s miserable weekend was capped after he suffered an exhaust failure on his Toro Rosso, forcing the Frenchman’s retirement on lap 24.